Recently Drone Class has been approached by a Danish startup with a request to get started with MAKKER, a training system for drone flying. Mikkel Barker, inventor and also drone pilot, sent MAKKER to us. Below you can read our review. 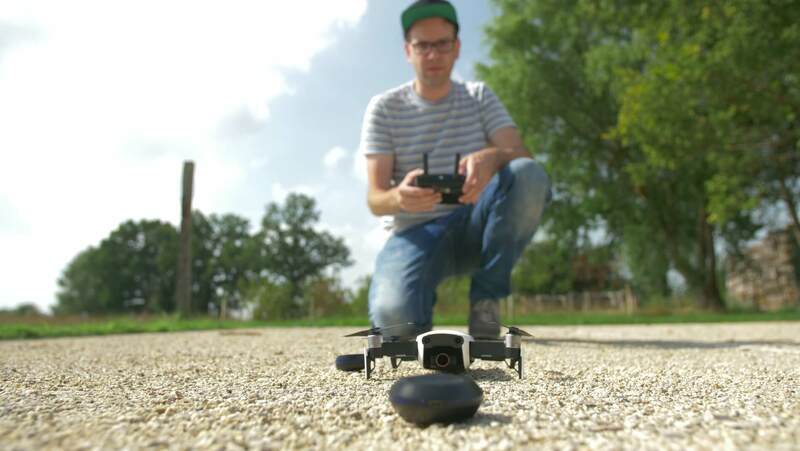 MAKKER is an infrared tag system, designed for consumer drones such as the DJI Mavic Air or a simple race drone. A small tag has to be placed on the bottom of the drone. This tag weighs 18 grams. Then you can set a course with three markers on a field. A marker emits infrared signals in a 40-degree field, which can be picked up to about 2.5 meters high in the air by the tag. Once the tag is in the infrared range, it lights up and a time is recorded. Via Bluetooth (4.2 or higher) the tag can be connected to your smartphone. When flying over a marker with the drone, the MAKKER app gives an audio signal on your iPhone or Android device. The app also keeps track of the time you fly from marker to marker or a lap across the entire course. The set was tested by Drone Class. You must first load the tag and the markers from the packaging. Full charging takes about two hours in total. The USB cable has four branches, so you can charge everything in one go. During the charging time you can read through the manual, which is clearly written and also with humour. That makes it fun to start. With MAKKER you can fly in two modes. There is a training mode, in which you have to fly to a marker and stay there for a few seconds. Then you fly on to the next marker. In addition, there is a race mode, where the setting of the fastest lap time is central. You do not have to hover over a marker, but you still have to ‘touch’ it via the tag on your drone. Connecting the tag to our smartphone, a Samsung S8, works fine. The app asks permission for connection via Bluetooth and within a few seconds the tag is connected. You set all markers at once. If you want to use the training mode, you do not have to do anything and you can fly. If you want to try the race mode, you must first set two of the three markers as a waypoint. The other marker is automatically recognized as start / finish. The app works without delay in the office. The markers are immediately recognized. The app registers the time and shows it on your smartphone, sorted by time. You can stop the time registration whenever you want and it’s also possible to return to the main menu. Curious about how easy it is to fly with MAKKER, we started some testing. A beach on the outskirts of Breda was actually the course for this first test. It was a sunny evening with a temperature of around 30 degrees. We flew with a DJI Spark and DJI Mavic Air. The tag unfortunately does not fit on the bottom of the DJI Mavic Pro, because of the sensors. If you are going to set out a course, it is useful to take something with you in the form of mats, pylons or other material. The markers are barely visible in the field. In any case, it is difficult to estimate depth while flying. This is limitation of flying line of sight. MAKKER works pretty strictly. You have to fly the drone exactly over a marker. If you fly slowly or slightly faster, MAKKER works smoothly. When we were flying very fast, we noticed a slight delay in time registration by the MAKKER app. 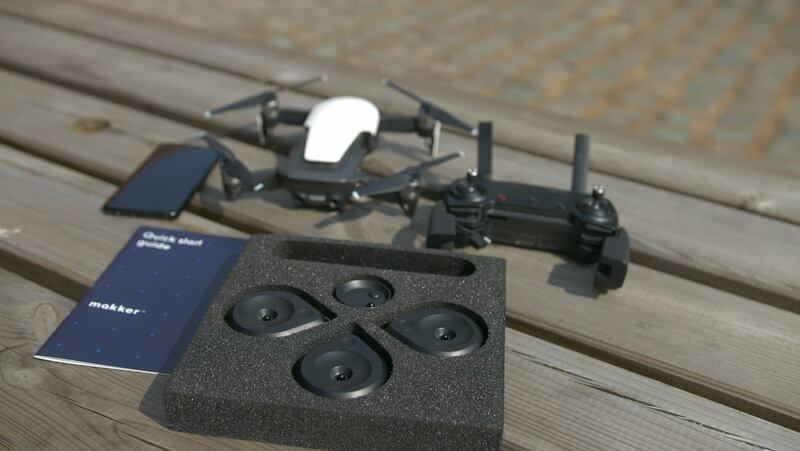 DJI Spark or Mavic Air ensures stability in the air, so these kind of drones are automatically hovering. MAKKER is most useful for setting and improving lap times. 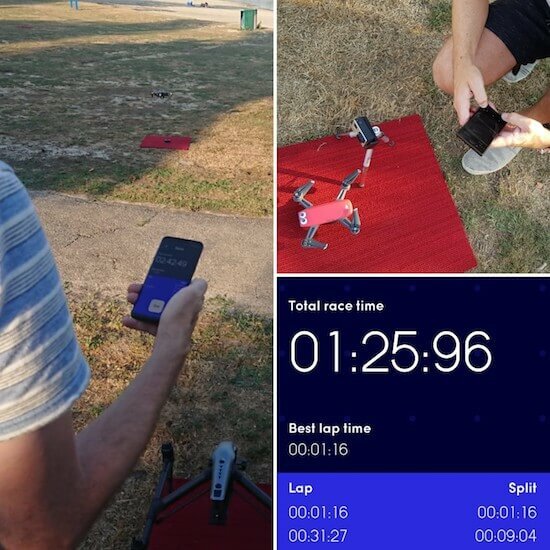 We advise trainers to fly with a drone that contains a so called ‘coach mode’ that enables you to manually correct the drone for the participant if it fails. If you have a lot of lap times in the app, you can scroll down in your screen to see all times. The app records lap times (lap) and the times between the markers (split). We would like to see that after racing the app gives a short summary of the fastest lap time, average speed, etc. That saves some search work and adds experience. Some more gamification would be nice for grinding. What would also be useful is an option to save lap times. Mikkel replied more features are coming. He wants to enlarge the infrared field that emits a marker. The app will also be loaded with new possibilities. MAKKER is a nice product that had been made with craftsmanship and pleasure by Mikkel. It worked fine during our tests. The race mode encourages you to put effort into becoming a more skilled drone pilot. That’s what trainers like! MAKKER has a sleek design and feels robust. With three supplied markers you can set out a course consisting of a start/finish and two intermediate points. This is sufficient for a short training. ← From commercial pilot to drone pilot!